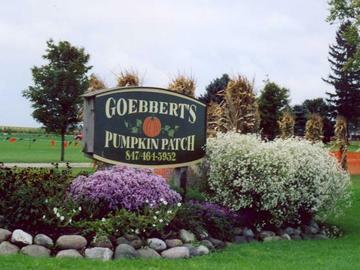 Goebbert's Fall Festival starts September 23rd, 2017 and runs through Halloween. We are a great place for families to come and have a great fall day. Come enjoy the animals, watch a pig race, see our famous Pumpkin Eating Dinosaur, have some lunch and pick out a pumpkin. We have plenty of fun attractions for the whole family! Also make sure to stop by the Farmers Wife Cafe & Bakery for some tasty treats, including our famous Apple Cider Donuts . Don't delay; our festival is only 6 weeks long! Everyone 3 years and older need to have a ticket to enter the farm. Children 2 years and under are no charge. Ticket bought for the Pingree Grove location ARE NOT redeemable at the South Barrington location. Ticket bought for the South Barrington location ARE NOT redeemable at the Pingree Grove location.